Oh, how I love a good Pasta and Pesto dish! 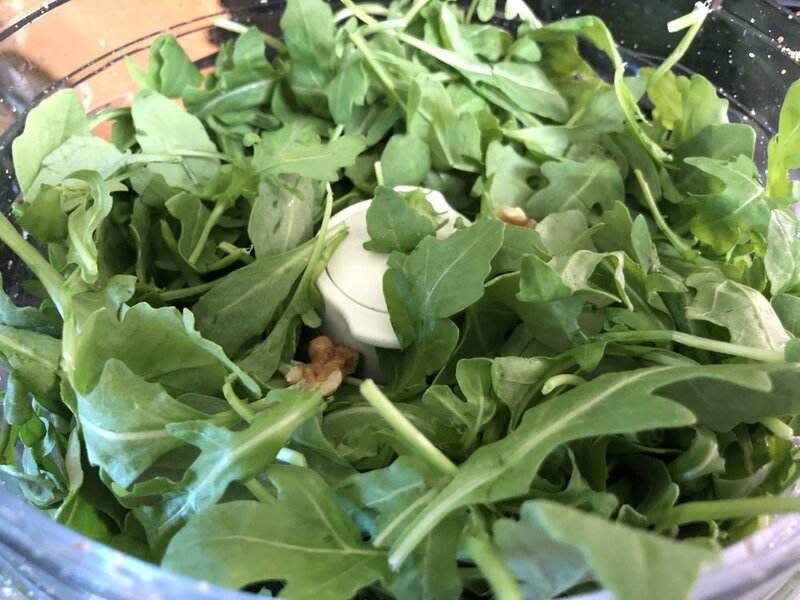 Arugula-Walnut Pesto is one of my favorite pestos to make… a close second is a Basil Pistachio and Parsley pesto, but I’ll save that for some penne pasta later. 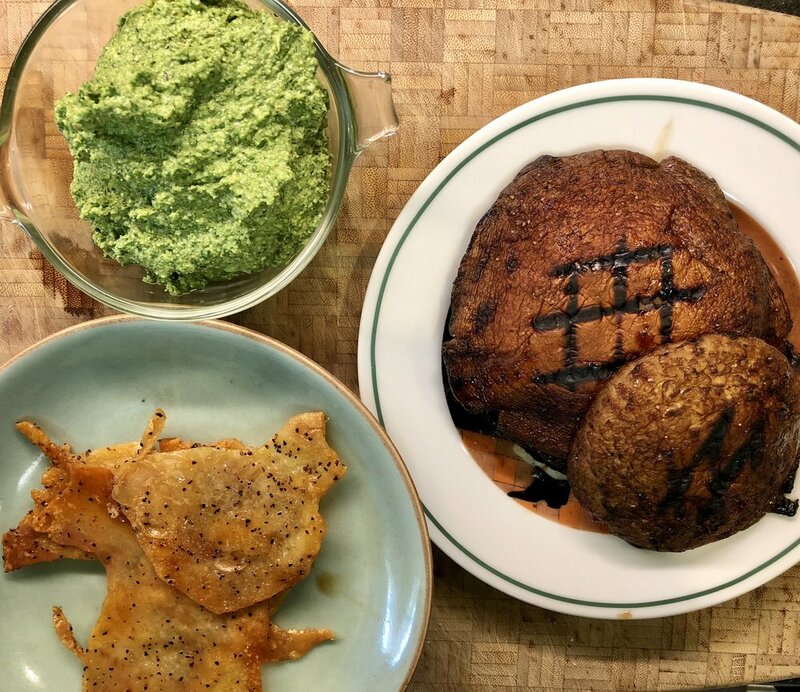 Like I was saying, Arugula-Walnut Pesto is wonderful and has this fresh, peppery, flavor that you can only get from fresh arugula. Combined with the meat like texture and charred flavored goodness of grilled portobello mushrooms, this is pasta dish was made for summer! Now, to add a little bonus to this dish, I’m adding crispy chicken skins for flavor and texture. Crispy chicken skins are one of my favorite “bar” snacks. Crisp and salty like potato chips with the added flavor of a delicious slow roasted chicken (thanks to a little extra help from In The Kitchen With Scotty’s “Roasted Beast” seasoning of course) that really lends itself as a nice surprise with this pasta dish. They are easy to make and trust me… very addictive to eat! In a food processor add the walnuts and garlic cloves. Pulse a few time to a loose crumb. Add the fresh arugula and process once more into a paste. Scape down the sides of the bowl and add the olive oil, parmesan, and lemon juice. Process again until fully mixed and you have a bright peppery vibrant pesto. Scoop out into a bowl, cover, and refrigerate if making ahead of time... or set out until ready for use. Laying out the skins, ready for the oven! Preheat the oven to 375 degrees. Line a large sheet pan with parchment paper. Lay each skin piece out flat. Place an additional piece of parchment paper over the top of the skins. Place a second sheet pan on top of that to add weight and keeping the skins flat. Place the entire pan and skins “sandwich” into the oven. Bake 15-18 minutes or until the crispy chicken skins are golden brown and crisp. Remove from the oven and cool. Dab off any excess oil from the chips. Eat whole as a savory snack or slice into strips and add to your pasta. A good pinch of In The Kitchen With Scotty “Cooks’ Line Seasoning” or your own salt and pepper. Heat your grill to medium-high heat according to the manufacturers directions. Wipe off the outside of your mushrooms. Remove the stem and scrape out the “gills” on the inside of your mushroom caps. In a small bowl combine the olive oil, balsamic vinegar, Seasoning, and minced fresh garlic. Mix well. On a large plate/platter, place the mushroom caps up and baste the inside of the “cup” with a generous amount of the marinade. Before grilling, flip the portobello mushrooms over and baste the outside of the caps. Place the mushroom caps face down, that's “cup” side down, onto the hot grill. Cover and grill for 5 minutes. Flip the caps over and grill an additional 5 minutes or until the portobellos are soft and “steak” like. Remove from the grill, cover and keep warm. In a heavy bottom-pot, bring salted water to a boil. Add your spaghetti and cook until al dente or however you enjoy your past cooked. Place the pesto in a large fry pan with no heat. Drain the spaghetti RESERVING at least 1/2 cup of the hot pasta water. Place the hot drained spaghetti into the frypan with the pesto, turning the heat on low. Start mixing the hot pasta and pesto together, adding a few splashes of the pasta water to break down the pesto allowing it to evenly coat your pasta. 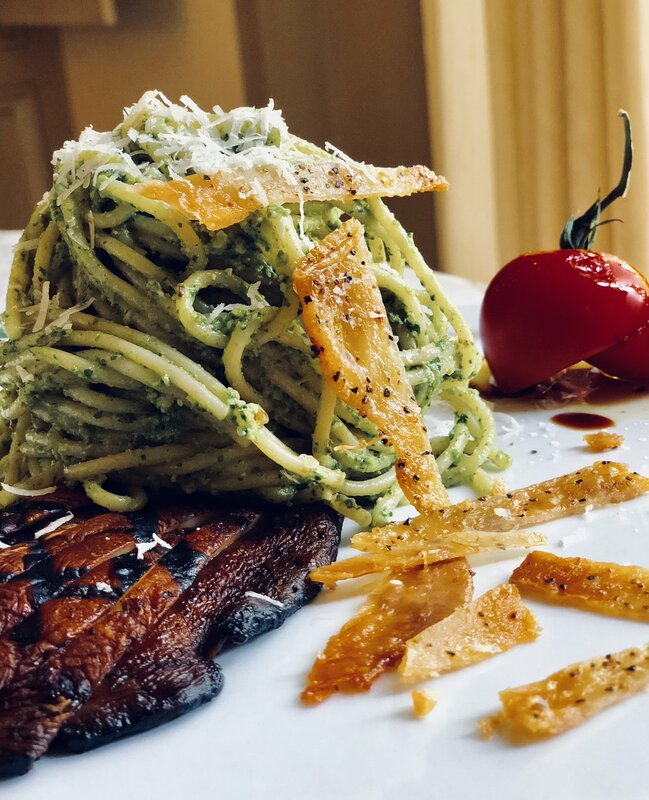 When the pasta is coated and hot begin plating: add the sliced grilled portobello, topped with a nice rounded off tower of spaghetti and pesto, finally adding the pieces or strips of crispy chicken skin on top. Garnish with as much grated Parmigiano-Reggiano cheese as you please, maybe some grilled cherry tomatoes and oil, a salad, or nothing at all. Enjoy!